The selections on The Lost Chapman Radio Broadcasts, Vol. I were from FM broadcasts produced by Keith Chapman at the John Wanamaker Store. Chapman's career came to an untimely end in 1989 when he and his wife were killed in a private-plane accident in the Colorado Rockies. After their passing, the masters were not located and the material was presumed lost forever. However, two listeners with superior recording equipment captured several FM programs on tape. 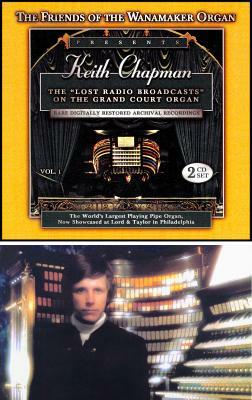 The best of these programs, spotlighting Chapman's unique approach to the Wanamaker Organ and his talents as a popularizer of beautiful music, are presented here, This release, on two Compact Discs, includes a detailed booklet on Keith Chapman, the Store radio broadcasts and the Wanamaker Organ, including many facts and figures. This disc has been a best-seller for the Friends and has already sold more than 3000 copies.